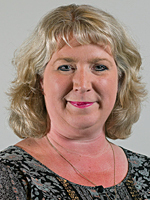 Elizabeth Sparkes has been a member of Worthing Borough Council since 2008, representing the residents of Offington ward, and is currently the Cabinet Member for Finance and Resources for the Borough Council. She has had a long career in London, working in the Financial Services sector and has recently retrained, now holding a Level 3 Teaching Assistant qualification. Elizabeth is a Governor at Worthing College and the Treasurer of West Worthing Tennis Club. Elizabeth is an Adviser to the Cabinet Member for Children and Young People.